A first-half goal from Gedo was enough to send Al Ahly through to the final of the African Champions League, as the Egyptian giants defeated Sunshine Stars of Nigeria. Ahly were 1-0 winners on the night, marching through 4-3 on aggregate and on to a meeting with North African rivals Esperance next month. A deflected shot past goalkeeper Moses Ocheje after 28 minutes settled the second leg of the semi-final after a 3-3 draw in Nigeria two weeks ago. 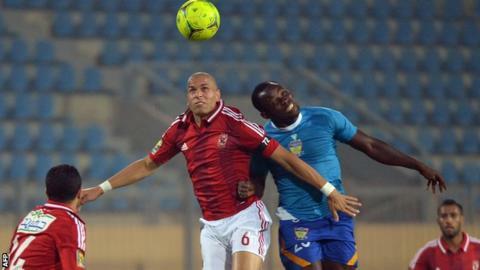 Ahly controlled most of a match that rarely rose above the ordinary. The contest was played behind closed doors as part of security measures, in place following deadly riots in February. Gedo could have finished the return match with four goals as the woodwork denied him twice in the opening half and once after the break while Sunshine substitute Harrison Egbune rattled the crossbar in the latter stages. Sunshine were featuring in the Champions League this season for the first time. Their preparations ahead of the second leg were not without incident, as protesters gathered outside their hotel. Cairo-based journalist Aaron Ross said: "They were holed up in their hotel for a while and got to the stadium quite late. "The match was delayed for half an hour but - even then - they had been through quite an ordeal before they ever made it to the match." Six-time African champions Ahly will face Esperance of Tunisia over two legs during November, with the Egyptians having home advantage first.